They are the product of an intriguing collaboration called “Solid Vibration” between two Dutch artists: Ricky van Broekhven, a spatial sound designer, and industrial designer Olivier van Herpt, who has a penchant for tinkering with digital fabrication technologies. The two men came up with the idea of mounting a speaker below a 3D ceramics printing platform. Then they played a variety of sounds as the printer did its thing. 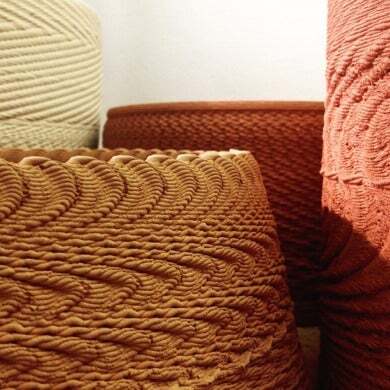 The vibrations from the sounds changed the printing pattern, giving the resulting pots a kind of knitted texture. Perhaps this reminds you of that X-Files episode where Mulder and Scully head to Hollywood to look into the mysterious “Lazarus Bowl” — an ancient piece of pottery said to have recorded Jesus’ words as he raised Lazarus from the dead. Featured image credit: Studio van Broekhoven.